6:1 Multi-function All In Fun Flip Top Table and Chair Set - Natural Wood with Red Accents. Features include: building blocks board, black chalkboard, CD-ROM map, white board, storage and paper dispenser. 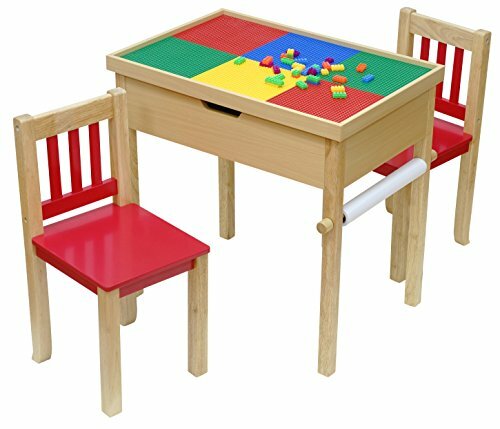 Easy Assembly, 1 Table/2 Chairs, for Age 3-12. Through the eyes of children, the world is a magical place full of wonder and inspiration. At OKIDS, we bring this perspective to life, providing striking furniture, toys and creative storage solutions to help enhance your children's environment. Our thoughtfully engineered products surpass the strictest Quality and Safety standards in the industry, providing you with peace of mind while promoting your children’s growth and development through unique and interactive features. If you have any questions about this product by O'Kids, contact us by completing and submitting the form below. If you are looking for a specif part number, please include it with your message.